I would like to sell my preorder for the second batch of Avalon. It's a 65GH+ unit with the PSU included. I'm a respectable trader that did a lot of transactions in the italian community and thus i don't want to use an escrow. There is a thread in the italian community where i have 15 pages of positive feedbacks from the last year. -The auction lasts 5 days, until the 26th of this month, 20:00 GMT forum time. Additional offers will extend the time for 5 minutes recursively. The payment will have to be done within 24 hours of the closing of the auction. 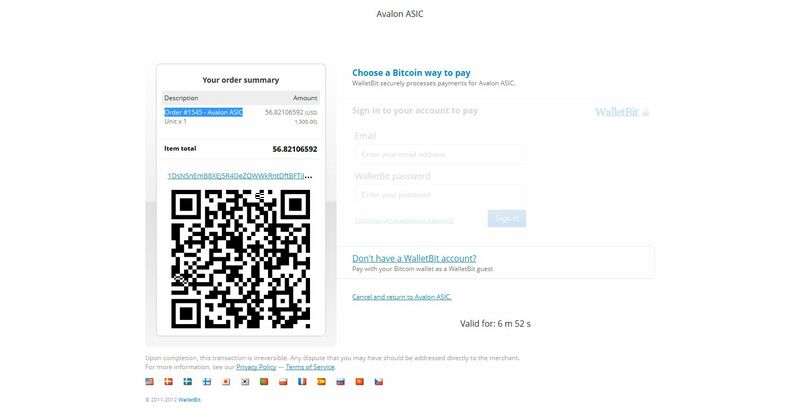 -The starting bid is 200BTC, you can bid in increments of 1BTC. -I will pay an express shipping service for your home as soon as i receive the unit. I will not even open the package. If you want to, i can mine with the unit in your behalf for a month or so and ship it after that. 2. 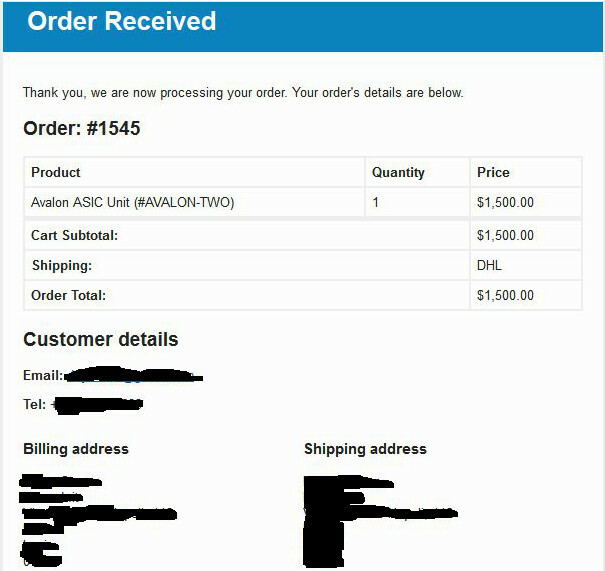 When I get the Avalon, I'll confirms to escrow and winner, and I will take photos/videos of unopened package. 3. I will pack the entire box (Avalon inside original packaging) in a new shipping box, taking care to not break the original packaging. 4. I will send the Avalon to winner. 6. Escrow releases BTC to me. edit: added details OP requested. I dont see a good reason why no escrow is allowed. John is doing it even for free if one is greedy. +1 no escrow screams scam. There is no reason not to use it unless you're looking to take advantage of someone. If you want to use an escrow, you will receive your unit later, since that i will have to ship the miner to the escrow that will reship it to you. Also, I want to be able to sell these btc on the EUR market before the releasing of the founds, another point against using an escrow. You send it directly to the buyer, not the escrow. He probably means that the buyer could claim that he didnt receive the unit or that nothing was in the package or something of that kind. Those kind of problems let me keep away of those sellings where insecurities are laying in. Yes, it's true. So much people trying to steal and more when it's a lot of money. If i think about the price of those machines... its so much that you really could hire a person that delivers it personally. Make a contract to film everything and set it up at the buyer so that the buyer cant claim it wasnt delivered. I mean what would that cost compared to the earnings? And to make the buyer feel better let the escrow keep the money until he gets the vote from buyer. If he claims somethings wrong you have a video to proof. I just sent a PM to john asking for his escrow service, I'll let you know. Replied with details in PM. Confirmed - please PM me when the auction is done. I will issue a complete contract including all details that will have to be agreed by both of you to prevent any issues afterwards. Happy bidding! What if the winner claims he got some stones? It could be that, after you took the photos, took the avalon out and put bricks into. Thats why i meant that you you should send someone personally there. That is taking a video from it. Non deniable proof. And the cost for that are easily covered i guess. Would be safer for the buyer, that could bid than, and safe for you because you can proof that the machine reached. Only my thoughts... good luck with the auction! The C) clause covers that - an excerpt from a PM conversation with OP. Yes. Please take photos of the seal by Avalon and all evidence, and insure it for the amount - if it arrives empty at the buyer, he can claim insurance for with your evidence given. Please declare appropriately at the Post office for this. I understand many courier services will check the items to determine if you're shipping an empty box and claiming insurance. Of course, the actual agreements will be far more extensive than this. I'm currently doing this for a few other #2 Avalon escrows too - shipping this all over the world for checking and resending will be really expensive, considering that there is a high chance that all three parties reside in different countries. Not to mention the hassle of going through customs, and the loss caused by the delay in shipping. I once bought a smartphone... got an empty box... and was lucky enough that it was only empty. So i opened it in front of the postman and at the end i got a refund. Now, when i get expensive packages, i always make a video of opening it to have a proof. I think the buyer should do the same. Thats a proof for his security. He shouldnt stop in between making it so that no one can claim that he took the machine out when the cam was out. I think he was interested too because the package was too light. The seller of course was seldomly stupid. Sent the smartphone in the original case so that everyone knew whats inside... Now i dont make experiences anymore with expensive items.